Like Andy Warhol, Australian artist Maria Kozic was fascinated by pop-culture icons, reworking sources that had become banal through overexposure. For her series MASTERPIECES 1986, Kozic translated celebrated images by 20th-century art ‘masters’ onto canvases that are literally fractured into irregular shards, imitating comic book explosions. 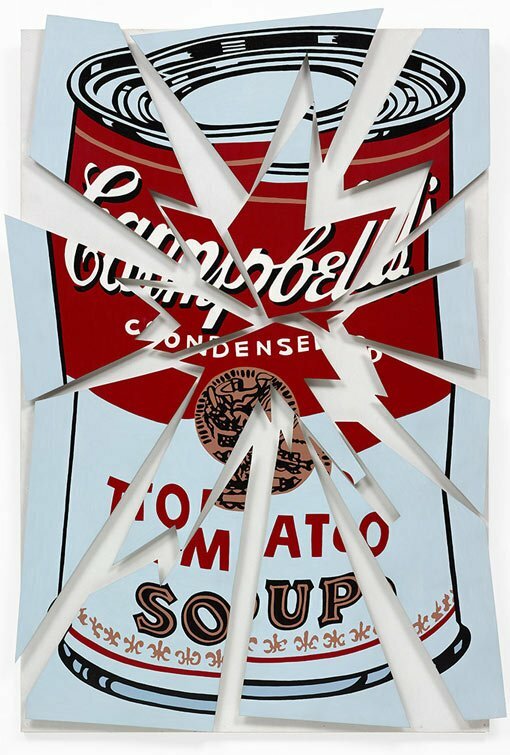 MASTERPIECES (Warhol) cites one of Warhol’s legendary Campbell’s soup cans, the subject of his inaugural solo exhibition at the Ferus Gallery in Los Angeles in 1962. With characteristic wit, Kozic’s gesture of ‘blowing up’ such an iconic image parodies the precious and ‘authentic’ status of the original – a Warholian sentiment that was widely invoked in postmodern art of the 1980s. This work also appears in the adult (7-12) and children’s (K-6) audio guides, available for rent, and in the free children’s trail. Consider the quote by Andy Warhol. What does it mean and how does it relate to pop art? Was this a radical way of thinking? In your argument, consider earlier approaches to artmaking and the notion of ‘artist as genius’. What makes an artwork a masterpiece? Who makes the decision to categorise an artwork in this way? What does this mean to the artist, the audience and the art world? Discuss this notion, with particular reference to Kozic’s MASTERPIECES (Warhol) 1986. Are the ideas and theories of pop art still relevant in contemporary art practice? Compare pop artists from the past with artists working today. What has changed and what has stayed the same? Be inspired by an artist in the exhibition and create a body of work based on popular culture today. What types of images and subjects are important? What forms of technology would you use? How would you present your work to enhance its meaning? But why should I be original? Why can’t I be non-original? Pop was one of the defining art movements of the 20th century. It was radical because it brought the realms of mass entertainment and consumerism into the hallowed halls of art galleries and museums. Pop artists looked to advertising, product design, packaging, television, film, tabloid journalism, celebrity photographs, pulp fiction and comic books for both subject matter and style. While for many this new art was a shocking betrayal of high cultural values, for others it was a liberating encounter with the world that people actually lived in. The Pop to popism exhibition considers art’s encounter with popular culture over four decades. It begins with pop’s origins in the 1950s, proceeds through the classic pop of the 1960s and early ’70s, and charts the return to pop culture by a new generation of artists in the 1980s. This is the first time Australian pop artists have been exhibited with their international peers, situating the story of Australian art within the broader pop art narrative.